Mobius Scribe is a powerful medical dictation app for iPhones. 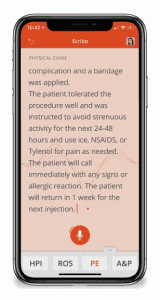 Scribe makes Dragon Medical – the world’s most reliable speech-to-text medical dictation software – instantly available in the Mobius app at half the cost of any other leading transcription service. Using Mobius Scribe for dictation, your words appear on the screen and text is immediately sent to the patient’s chart. Scribe makes transcription and clinical documentation faster, so charts that once took hours to close are now done in minutes. To access Scribe from the Mobius app, click “Documentation” from any patient chart and press “Dictate” in the red strip above your keyboard. 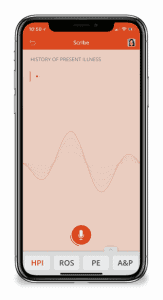 When the app is actively transcribing voice to text, the microphone button will be red and a sound wave will oscillate in the background. As you speak, words will appear following the blinking cursor. Mobius Scribe is the next-generation dictation software that uses deep learning and neural net technology to adapt to your voice patterns. That means all you have to do is speak like you would to anyone, and Scribe does the typing. However, there are some useful tips and tricks to ensure perfect results when using medical dictation software. For example, numbers are typically written out as words (not digits), unless dictated together with dates, date ranges, times, measurements, dosages, and symbols. To prompt Scribe to write a number in digits, just say “numeral” followed by the number. sign” for % or “equal(s) sign” for =. You get the picture. Contact the Mobius team for a full guide to dictating symbols and numbers. You can switch between documentation sections while the app is actively listening. Just tap on the buttons in the bottom bar, or speak the name of the section. For example, to switch to the Physical Exam section, say “PE” or “Physical Exam”. You can do this even while the app is actively listening for words to transcribe. Press the microphone to stop transcribing and edit text with your finger. To select text, run your finger over the desired words or phrases – the same motion you would use to highlight with a marker. This will highlight individual words, phrases, and sections, depending on how much of the text you swipe your finger over. Double tap on existing text to place your cursor. Once the cursor appears, you can long-press (tap and hold) on the screen to precisely adjust the cursor location. 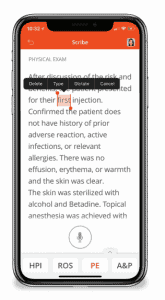 For even more efficient medical dictation, you can also use voice commands to edit text as you transcribe. Vice commands will also let you select the next words spoken. You can say “cap” to capitalize the next word, or “all caps” to capitalize all letters in the next word.” Say “all caps on” to active caps lock or “no caps” to prevent the first letter of the next word from being capitalized. Make sure to pause before and after saying a voice command to ensure that it is processed as a command and not as text. Doctors are frustrated with time spent on clinical documentation and how it cuts into patient care. With physician burnout on the rise, why not use your smartphone and medical dictation software to streamline clinical documentation? 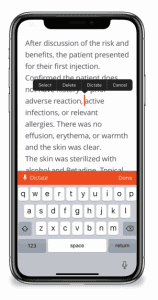 Request a demo today to see how Scribe could empower your practice with the revolutionary technology behind Dragon Medical dictation software.